The Ecological Culture Initiative is launching an in-depth class series this week featuring all the basic skills and knowledge needed to develop a bio-intensive vegetable garden from the ground up. Topics will include permaculture design and application, soil analysis and amendments, compost preparation, plant propagation, rain harvesting and irrigation, organic pest and disease management, edible natives, pollinators, seed saving, and winterization. The program is divided into four distinct modules of eight classes each. 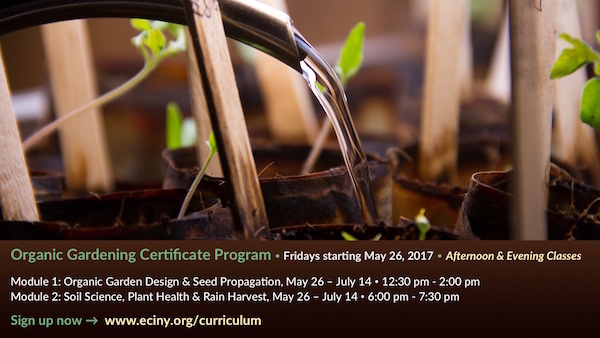 Students who complete the whole series of 32 classes will be rewarded with a certificate in organic gardening, presented by the Ecological Culture Initiative. Course literature and materials are included with registration. The course will be a combination of both classroom instruction and fieldwork. Students should be prepared to work outdoors during some sessions. Instructors: Rachel Stephens and Marc Fasanella (with additional guest lecturers). Fee per Module: $240 Southampton Town resident, $250 non-resident (8 classes). Southampton Town residents will be reimbursed $10 per program by ECI upon proof of residency.